One of the most boring movies ever made. I love movies about cavemen, or pre-history. I don’t care how accurate they are- part of the fun is that there are things we still don’t know or understand, though I’m pretty sure 10,000 B.C. doesn’t contain a scintilla of historical accuracy other than that in that year, humans inhabited the earth, had spears, and hunted mammoths. 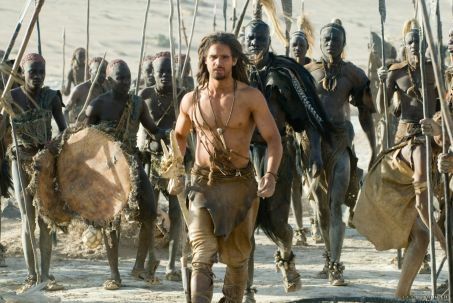 Another numerical movie, 300, took huge liberties with history from its comic book source material, but made it work. Here everything sticks out like a sore thumb due to hamfisted directing, languid pacing, and idiotic plotting. Meet D’elh, a nomadic hunter prophesied to be the John Connor of his hipster tribe, who sport goatees and dreadlocks. 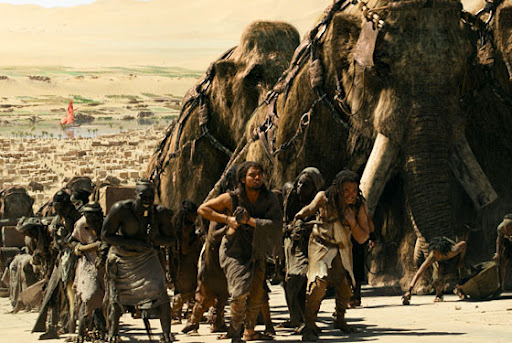 They hunt mammoths with nets, after making them stampede by jumping up and screaming at them. One day a tribe of “four-legged demons”- horsemen- kidnap half their tribe, including Del’s woman. He’s the only one who wants to give chase, so he heads out with 5 ethnically diverse and suspiciously clean buddies. We feel every minute as they chase the slavers from northern Europe to Egypt, picking up African tribesmen and a sabretooth kitty along the way. Then his ragtag band wages war on the pyramid-building empire using pointy sticks. Now, this could all be a blast. I love stupid premises like “what if stone age nomads fought an empire in Egypt, who have swords and mammoths?” I loved Outlander (full review), which was essentially Vikings vs. Alien vs. Predator. That movie was actually longer than this one, with a smaller budget, by a fledgling director, and felt tightly paced, exciting, and new. 10,000 B.C. makes us follow Dell thousands of miles, set to horrible narration explaining stuff that we’re actually watching, to give us a 5 minute battle where a few handily thrown spears take down an immense empire. The writing is so terrible that we see Evolet, the woman the whole journey is based on, die and then revive, just to give us a happy ending. Baaawkk! This one’s a toikey! To use that metaphor, watching this movie is like being asleep during the good part of a “Happy Ending,” and waking up the next morning with your belly-mess cemented in your happy trail. The best parts are in the trailer- a fight with feathered velociraptors, a sabretooth deus ex machina, and some CG of mammoths building the pyramids. 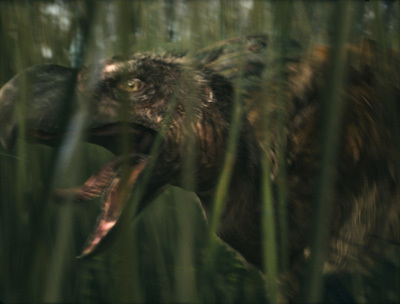 It doesn’t help that the CG movement is terrible- the mammoths don’t move like any elephant I’ve ever seen, the killer dodos remind us of Jurassic Park, and the sabretooth is gone faster than you can say “we blew our CG budget on the raptor fight.” Roland Emmerich is known for making polished turds, but now he’s managed to top The Day After Tomorrow– which while inane, was at least fun to look at- and that movie’s monster was cold air that you could escape by shutting a door. Don’t even waste space on the Tivo for this one. It’s a stinker. ha – this was on today and i was “watching” it for about 20 minutes when i realized i hadn’t watched it all so i changed the channel. Mammoths built the Pyramids? That explains everything.